Use a special code to bag a discount on all things PC gaming parts and peripherals (and literally everything else electronic) today. Here's a straight link to the ebay video games and consoles page. Now is a great time—literally today—to pick up any PC gaming gear you might have your eye on. 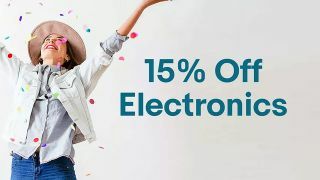 With eBay UK offering 15% off any electronic order when you input the code PLAY15 at checkout, there are some great PC gaming savings to be had. These are only a few of deals we recommend to maximise the code's value, but the whole of ebay's electronic and gaming listings are at your disposal meaning you're sure to find something to jump on and make the most of the code today. Make sure whatever your electronic purchase is, it comes in over 20 quid and you'll be laughing with 15%, or that maximum 50 quid, off!